Quiet rooms, with views of the gardens, woodland and mountains. All rooms have en suite shower, free wifi, a private patio area and tea/coffee making facilities. Rooms can also be offered in a twin configuration upon request. Perfect for honeymoon or romantic getaway. This Suite features a large bath & shower in room, separate en-suite & small private garden. Lounge with a day bed & fireplace for those winter evenings. Perfect for honeymooners and romantic getaways, this room offers Mountain views, tranquility and privacy. Room includes a king size bed, free standing bath. Also includes outdoor shower and wood burning stove. A large, stunning, secluded room with private stoep. A private garden with fire pit and garden furniture complete this home away from home. En suite with roll top bath and shower. Mountain views. Brand New Log Cabin. 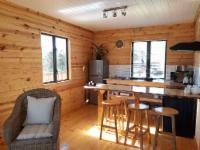 A 2 bedroom log cabin, with full kitchen, and lounge/ dining area, large stoep with Jacuzzi and Braai. Perfect for a weekend away with friends. Cancellation is only accepted upon written acknowledgement of the cancellation. Cancellations prior to the arrival date will be subject to the following penalties: 29 + days prior to arrival - 50% of deposit paid 15 - 28 days prior to arrival - 75% of deposit paid 0 - 14 days prior to arrival, or no show - 100% of deposit paid Cancellation DURING your stay - No Refund The above cancellation policy does not apply during periods when there are special events planned at Essere Lodge or during the Festive Season - during which time full cancellation fee of 100% applies from 30 days.